By now you’ve likely heard of VMware Cloud on AWS, either from the first announcement of the offering, or more recently as activity in the space has been heating up since the product has reached a state of maturity. On-premises, we loved what VMware could do for us in terms of ease of management and the full utilization of hardware resources. However, in the cloud the push for native services is ever present, and many first reactions about VMC are “Why would you do that?” This is certainly the elephant in the room whenever the topic arises. Previous experience with manually deployed VMware in the AWS cloud required nested virtualization and nearly the same care and feeding as on-premises. This further adds to initial reaction. Common sense would dictate however, that if the two 800-pound gorillas come together in the room, they may be able to take on the elephant in the room! As features have been added to the product and customer feedback implemented, it has become more and more compelling for the enormous installed base of VMware to take advantage of the offering. What are the best features of VMware Cloud on AWS? Some of the most attractive features of the cloud are the managed services, which reduce the administrative overhead normally required to maintain reliable and secure operations. Let’s say you want to use SQL Server in AWS. Moving to the RDS service where there is no maintenance, configuration or patching of the underlying server is an easy decision. After some time, the thought of configuring a server and installing/maintaining a RDBMS seems archaic and troublesome. You can now have your DBA focus on the business value that the database provides. VMware Cloud on AWS is no different. The underlying software and physical hardware is no longer a concern. One can always be on the optimum version of the platform with no effort, and additional hardware can be added to a cluster at the press of a button. So, what software/service helps manage and control the entirety of your IT estate? There are many third-party software solutions, managed service providers, and up and coming native services like Simple Systems Manager. Now imagine a cloud based managed service that works for on-premises and cloud resources, and has an existing, mature ecosystem where nearly everyone in Enterprise IT has basic to advanced knowledge. Sounds attractive, doesn’t it? That is the idea behind VMware Cloud on AWS. The architecture of VMC is based on dedicated bare metal systems that are physically located in AWS datacenters. VMware Cloud on AWS Software Defined Datacenters (SDDCs) are deployed with a fully configured vSAN running on NVMe Flash storage local to the cluster, which currently can expand up to 32 nodes. You are free to provision the hosts anyway you see fit. This arrangement also allows full access to AWS services, and keeps resources in the same low latency network. There is also a connector between the customer’s AWS account and the VMC SDDC, allowing direct low latency access to existing AWS resources in a client VPC. For management, the hybrid linked mode gives a single logical view spanning both on-premises and VMC vCenter servers. This allows control of the complete hybrid environment with vCenter and the familiar web console. There is no immediate requirement for refactoring of existing applications, but access to AWS services allows for future modernization. Very little retraining of personnel is required. Existing scripts, tools and workflows are reusable. Easy expansion of resource footprint without deploying more physical infrastructure. Easy migration of VMs across specific geographies or between cloud/premises for compliance and latency reasons. VMware native resiliency and availability features are fully supported: including DRS for workload distribution, shared storage for clustered application support, and automatic VM restart after node failure. 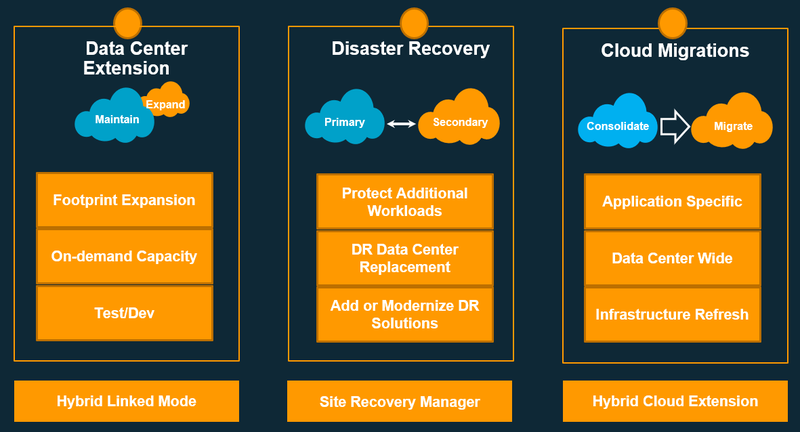 DR as a service with Site Recovery is supported, including the creation of stretched clusters. This can provide zero-RPO between AZ’s within the AWS region. This service takes advantage of the AWS infrastructure which is already designed with high availability in mind. VMware Horizon 7 is fully supported. This can extend on-premises desktop services without buying additional hardware and enables placement of virtual desktops near latency-sensitive applications in the cloud. The service has GDPR, HIPAA, ISO, and SOC attestations to enable the creation of compliant solutions. Region expansion is underway and two new regions have recently come online in Europe. Discounts are available based on existing product consumption and licensing. Integration with CloudFormation for automated deployment is available. So for those currently using VMware and considering a move to the cloud and/or hybrid architecture, VMware Cloud on AWS offers the most straightforward gateway into this space. The service then brings all the hundreds of services in the AWS ecosystem into play, as well as a consistent operational model, the ability to retain familiar VMware tools, policies, management, and investments in third-party tools. So instead of planning and executing your next hardware refresh and VMware version upgrade, consider migrating to VMware Cloud on AWS! For help getting started migrating to VMware Cloud on AWS, contact us.